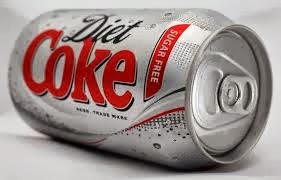 I would say it's been about six months now since I have bought (or drank) any diet drinks. The more I have been reading about them, the more I realize that they just aren't healthy for you. And so I have decided that I will not buy them for myself, or for my family, anymore. I decided that if we are going to eat or drink something sweet, it is going to be the genuine stuff. And then on Friday night, I needed to take drinks to a get-together. I absent-mindedly grabbed two gallons of Swiss tea and went on my merry way. It wasn't until after the evening was over (and I had already drank a nice tall glass of the Peach flavored tea) that I realized the word diet was on the label. You see, I have been working really hard to lose some weight. And, thus far, I have found my hunger fairly easy to control. It's been difficult but not impossible. Until yesterday. Yesterday I was STARVING all day. I could not seem to satisfy my hunger. Now it could have been my hormones. That is possible, as they are fairly unpredictable right now. BUT, the other thing I couldn't help but remember is that I had had diet tea the night before. Could that have possibly been the culprit of my insatiable hunger? I don't really know, but the possibility of that cause and effect was enough to ensure that I will not be drinking any more diet drinks. Has anyone else noticed a correlation between diet drinks and hunger? Yes, that is what I was thinking, too! Thanks for the confirmation:) not sure what was in the tea but, needless to say, I won't be drinking that again right away!